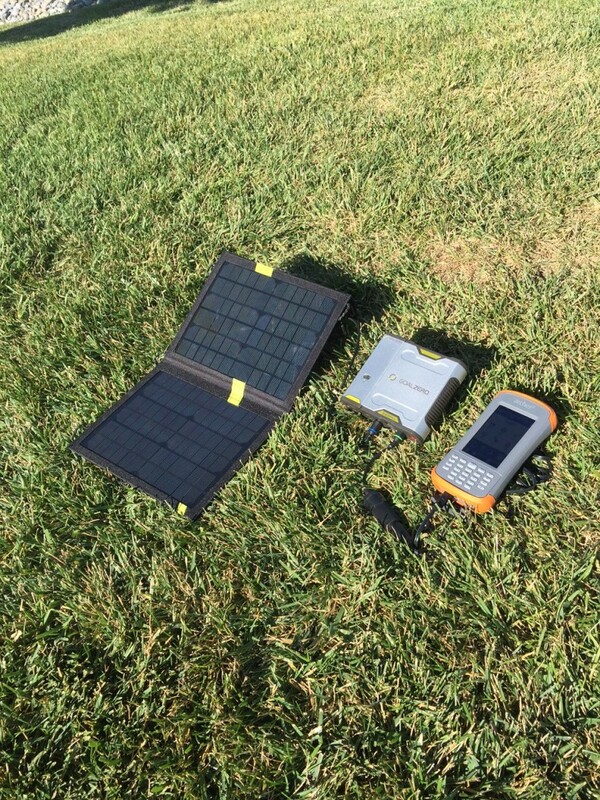 Goal Zero’s Sherpa 100 Solar Power Kit is used to charge the Archer 2 rugged handheld. Both the Archer 2™ and Allegro 2™ use a long-lasting, Overtime Technology™ battery, with runtimes in excess of 20 hours in many use cases. While this amount of battery power is outstanding, sometimes, for whatever reason, you can’t get to an electrical outlet. Maybe you’re working in a remote location for an extended period of time like this expedition team, or maybe you just plain forgot to charge your rugged handheld. And in those cases, you need to find another way to get power. One option that some users with extended field operations have used to recharge their rugged handheld is a solar-charging system. When it comes to solar-charging systems, it’s important to remember that they are more than just a photovoltaic cell array. Rather, they are a system of interacting components, where the solar cell array is just one part. An effective solar power system serves the purpose of converting solar energy to electrical energy by creating a potential (voltage), and storing that energy so it can be used later (a battery). The best solar systems today are a balanced combination of energy conversion (solar cells), storage (battery), and transmission (voltage converter and connectors). Juniper Systems has evaluated the Goal Zero Solar Power kits and found the Sherpa 100 Solar Power Kit ($599 online) to be one of the best combinations of solar charging capability and power storage capacity. The system includes a battery and power inverter that can fully recharge any Juniper Systems handheld using either the AC Power Supply or an accessory 12VDC Vehicle Charger Cable (Juniper Systems part #12517). During the day, the Goal Zero power kit is set up at the base camp, charging the Sherpa power pack while the user is in the field. In the evening at base camp, the Sherpa power pack is fully charged, and the Archer 2 is plugged in and recharges off of the Sherpa 100. This has proven to be the most effective system for field solar power. 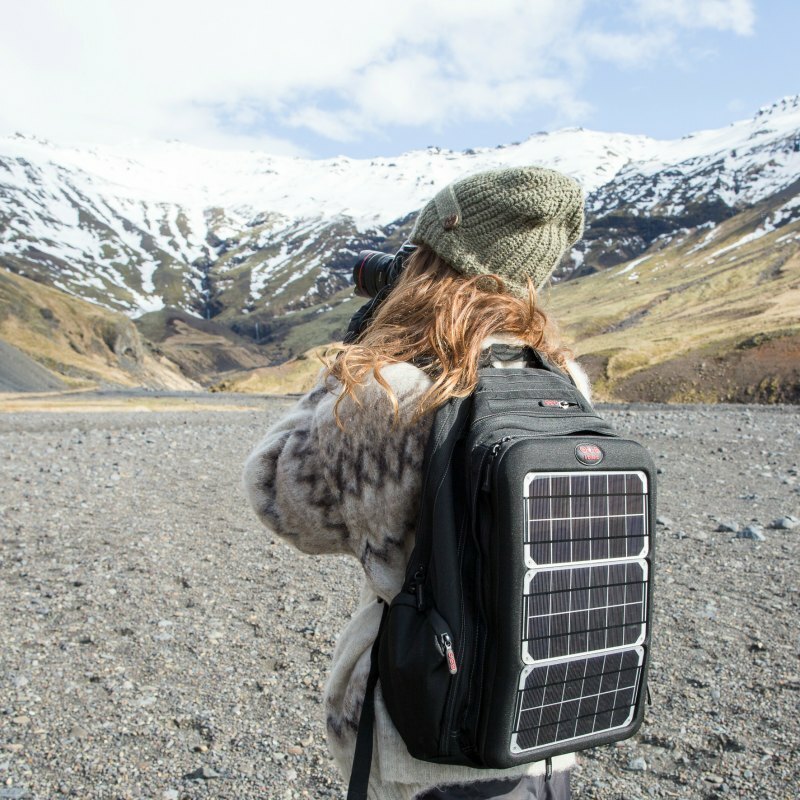 Another product to consider that we have found to work well is Voltaic Systems’ Array Solar Laptop Charger Backpack ($389), which includes a complete charging system built into a backpack. The convenience of this option is that the solar-charging components are integrated directly into the backpack, and everything else can fit inside the pack, including your handheld, field supplies— even your lunch! And since the solar cells are integrated into the pack, you can charge the handheld on the go. These are a couple of effective solar-charging options that we recommend. Have you ever charged your handheld via solar power? What product did you use and how did it work? To see more of Juniper Systems’ rugged handheld computers, visit our website here.